“What if I fall and hurt myself? Would you know how to fix me?” Ratcliff sings, leaning in to the microphone and stepping on and off an effects pedal attached to his guitar. 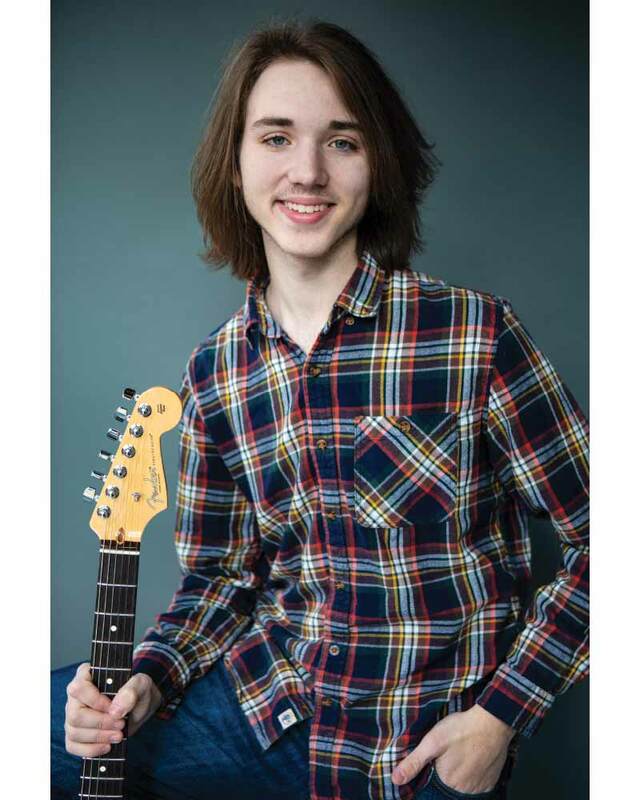 As Ratcliff sways and strums, drummer Eli Pfotenhauer, the other half of The Feel Good Project, more than keeps up, banging out the beats that speed the song to its finish. With the lights on, the room is a surprising shade of light pink, which reveals its former iteration as Ratfcliff’s sister’s dance studio. Adaptability is a good skill to have when you’re seventeen and playing in a band. In the just-under-a-year that The Feel Good Project has been in existence, band partners Ratcliff and Pfotenhauer have created and performed their own songs, but also backed up lots of other friends’ bands. The two are also former members in several more groups. “It’s just what everybody does,” explains Ratcliff “And when we perform out in public, we have two other musicians who join us— Ben Hodonicky who plays keyboards and guitar, and bass guitarist Matt Daly,” adds Pfotenhauer. For Feel Good Project songs, Ratcliff writes the lyrics and composes the chords. Pfotenhauer, who loves music production, does the recording, mixing, and mastering. During rehearsals, the give and take between drummer and guitarist helps shape each song into its finished version. To build a following, the two—both high school juniors, do a lot with social media, posting photos of weekly rehearsals and recording sessions. Putting some of their music on a distribution hub led to the group’s songs being picked up by Spofity, Apple Music, You Tube, Sound Cloud, and more. “What’s been really cool is that now, people I didn’t know are sending me videos of themselves singing The Feel Good Project songs and really having a good time,” says Ratcliff. 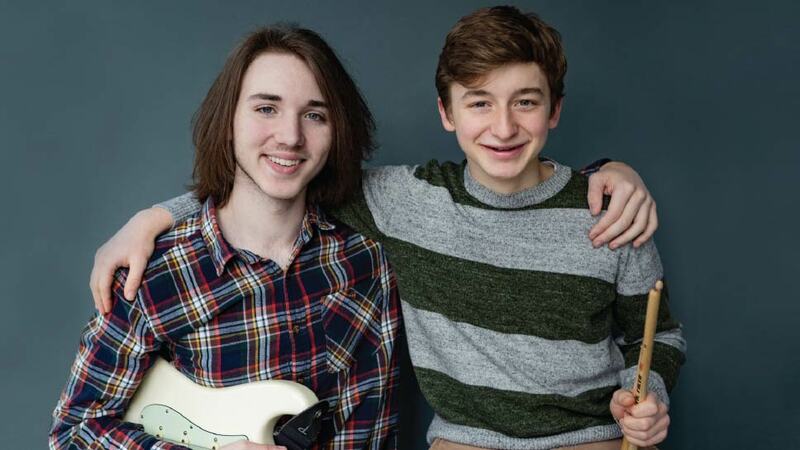 The two are also excited to be among the bands performing in of Hinsdale’s Uniquely Thursdays summer concert series at Burlington Park. “That’s a big opportunity for us,” says Ratcliff. “When I was a little kid, we used to go to Uniquely Thursdays and to me, there was always an almost mythological feeling to the bands up there performing. To me they were, ‘The Band!’ And now, we are going to be ‘The Band!’,” Ratcliff laughs. Ratcliff and Pfotenhauer met though a show at the Rock Academy, where Ratcliff started guitar lessons two years ago. He had been writing songs and when Pfotenhauer added his drumming, good synergy happened and a partnership was born. Both of them studied piano as kids, and Pfotenhauer started playing the drums in sixth grade. For Ratcliff, big musical influences included The Beatles, Mac DeMarco, Tame Impala, Jimi Hendrix, and John Frusciante. The band Vampire Weekend was a favorite of Pfotenhauer’s, “And of course, the drumming of The Jimi Hendrix Project,” he says. Describing their sound, the band shies away from firm labels, but loosely fits under indie rock or “alternative with roots in the classic stuff” categories, says Ratcliff. The name of the band was born out of a disagreement Colin had with members in a former band over the direction they were taking one of his songs. @thefeelgoodproject1 or on twitter @TheFeelGoodPro1.